Collecting raspberries near a forest is not a job but an activity that is romantic and connects us with nature. Raspberries are a magical little fruit. The color, fragility, and delicacy of the flesh creates a surprising flavor in your mouth. When my son was little we would spend the holidays on the Asiago plateau. We took long walks and often walked back with a basket of raspberries. Those raspberries were eaten immediately accompanied by a little whipped cream. The memory of those days led me to create the recipe for the “basket” that I propose. I didn’t add cream in the recipe, but if you like a softer crust you can add a spoonful of whipped cream to the recipe and top the tart with raspberries and a little powdered sugar. Add the flour, salt, cold butter (cut into small pieces) and vanilla in a large bowl. Mix the butter with the flour, working quickly with your fingertips until you have a crumbly dough. Add the sugar, ground hazelnuts, and two egg yolks. Quickly knead until you have a smooth dough. (Refer to the step from the “Almond Crescents” recipe). Let stand 30 minutes in a cool place or the refrigerator. Turn the oven to 350F. Butter 8 tart ramekins. Place a bit in each of dough in each and form a shell. Place a circle of parchment paper in each ramekin and add some beans or ceramic balls to weigh down the crust. Bake for 15 minutes. After this time, remove the tarts remove from oven, remove the beans and parchment paper and allow the pastry to cool inside the mold. In the meantime, melt the chocolate in a container with a water bath. With a silicone brush, spread the melted chocolate inside tart. Allow to dry. 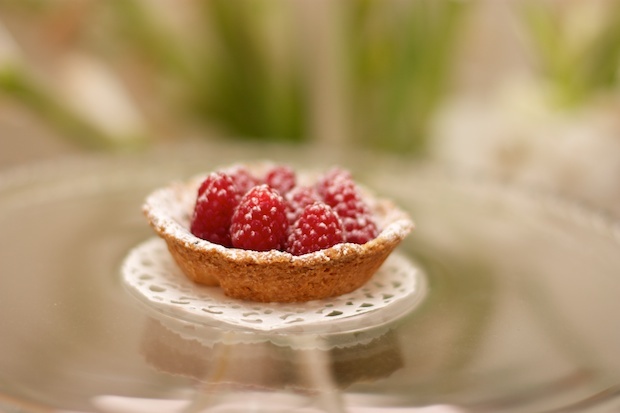 Place a few raspberries on each tart and sprinkle with powdered sugar. Posted in Dessert, Recipes. RSS 2.0 feed.